by Łucja Biel. Frankfurt am Main [et al. ], Peter Lang 2014. Like other European languages and language variants, legal Polish has changed throughout the decades due to cross-linguistic and cross-systemic contacts. 1 In the book under review, Łucja Biel 2 focuses on the most recent changes that followed the accession of Poland to the European Union in 2004 and resulted mainly from translation. The author analyses the linguistic qualities of EU law translated into Polish as compared to the language of national law, so in fact compares translations against non-translations. A proposed hypothesis assumes that "translated EU legislation differs from nontranslated Polish legislation" due to the hybridity of EU discourse and the nature of the translation process (2014: 13). The analysis is carried out on the macro-level of genre conventions and micro-level of collocations. The author also takes a wider perspective and attempts to evaluate the impact of EU language on Polish by comparing Polish national law in its pre- and post-accession versions of 1999 and 2011, respectively. The project is of pioneering nature because it deals with the under-researched field of EU translation, the phenomenon of eurolects and its impact on the national legal language. Moreover, it contributes a Slavonic perspective, different from those of Romance and Germanic languages. It refers to the concept of textual fit introduced by Andrew Chesterman (e.g. 2004), operationalises it and demonstrates how it may be successfully applied in legal translation research. The book comprises of two parts. Part I consists of three chapters, which introduce the themes that delineate the framework of the research project presented in Part II. Chapter 1 explores the topic of legal language and its qualities. As shown with reference to numerous sources, both the definition and the categorizations of legal language are rather relative, and to some extent system-dependent. What is more, the majority of classifications fail to reflect the fact that genres that build up (legal) language are interlinked and hierarchically interdependent. 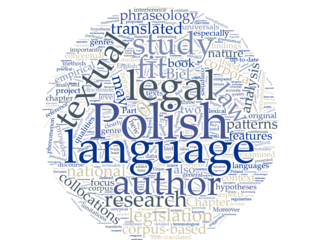 The author continues with a focus on a national variant of the language under analysis, i. e., legal Polish. It still remains heavily under-researched, especially with the use of new tools and up-to-date methodologies, such as corpus-based methods. These have proved to be especially efficient in the research into phraseology, which is one of the qualities of legislative language that is of particular interest to the author. Phraseology becomes the focus of the last part of Chapter 1. A concise overview of two major approaches to this issue is an invaluable starting point for further discussions, especially considering the terminological and conceptual chaos typical of a young and fast-developing field of knowledge. Most importantly, Biel proposes her own phraseological continuum observable in legislative language that covers text-structuring patterns, grammatical patterns, term-forming patterns, term-embedding collocations and lexical collocations (2014: 36). Chapter 2 deals with EU discourse, especially in the context of translation. The author argues convincingly that the translation of EU legislation does not constitute a type of legal translation and due to its complexity should be viewed as a category of its own. In fact, translation of EU law differs from legal translation to such an extent that it "challenges some central concepts of translation studies" (2014: 59). Biel elaborates on the notion of hybridity in the context of EU translation as particularly appropriate. Remarks on the differences between regulations and directives (i. e., the sub-genres selected for the empirical analysis) as regards translatorial aspects provide a link to a highly comprehensive and multifaceted account of the translation of EU law. What may be found particularly informative is the subsequent description of EU English being perceived as "essentially a new genre" by some scholars (after Robertson, cf. 2014: 63), along with the revealing remarks on its translation-shaped, hybrid and deculturalised nature. Biel provides an accurate outline of EU English qualities, from terminological aspects and conceptual interdependencies to syntactic and lexical features. An interesting notion of conceptual osmosis is introduced and defined (2014: 66). Last but not least, the reception of EU law translated into Polish is analysed in the context of (not) meeting the expectancy norms of the Polish audience. The last section of this chapter is devoted to the difference between EU language and the language of national law, as well as the influence EU translation may have on national legal languages. In the conclusion, Biel notes that following the accession of Poland to the European Union, the hierarchy of genres in Polish legal discourse has been transformed. A new hypergenre (or a super genre) of legislation has emerged: it comprises national law and EU law (in translation), which interact dynamically and are in complex power relations. In consequence, the Polish language of the law also comprises two varieties: national legislative Polish and EU legislative Polish. The author ends the discussion by describing the links between the above-mentioned genres and varieties of language. Chapter 3 is of a methodological nature. It focuses on issues connected with corpus-based translation studies. It also introduces the notion of textual fit and suggests how it may be operationalised in the context of corpus-based translation analysis. Before the author presents her operationalisation of textual fit in the study of EU legislative Polish, she provides a thorough description of the aspects that are brought into particular focus in the empirical part of the project. The account begins with a detailed discussion of translation universals (recently more often perceived in a less explicit way as features / tendencies / patterns / regularities of translation or qualified generalisations — cf. 2014: 98). While examining the topic of textual fit, it would not be possible to omit the phenomenon of interference, a logical and confirmed source of unnaturalness in translation. Thus, a reference to the law of interference as proposed by Toury (1995, 2004) is made and potential reasons for interference are examined. The other important aspect of textual fit is phraseology, which is increasingly researched in the context of translation with the use of corpus-based methods. The author identifies a few reasons for the considerable challenge that phraseology poses in translation, connected with both translation competence and cross-cultural incongruities. Next, the causes of phraseological distortions in translation are discussed and the specificity of legal translation is examined, where "unnatural collocations [...] result from conceptual lacunas between the legal systems and the need to convey elements of the SL [source language; added by ZERL] frame which are absent in the TL [target language; added by ZERL]" (2014: 114). The author underlines the scarcity of studies on phraseology in legal or EU translation, and ends Part I with interesting questions concerning collocational patterns in EU translation. A short although most explanatory description of how textual fit is to be defined and examined leads the reader to Part II of the book, which presents the design, procedures and findings of an empirical study on translated versus nontranslated legislation. In Chapter 4 Biel rigorously presents the corpora used in the study. Her general methodological approach may be described as a combination of Baker´s method based on comparable corpora and a more up-to-date method using multilingually comparable corpora, where translations are compared against original texts and against TL non-translations that correspond to the original texts. In practice, four corpora are used in the empirical part of the study. The main corpus consists of EU legislation translated into Polish, and three reference corpora contain respectively non-translated Polish legislation (with an additional corresponding corpus of pre-accession versions, compiled in order to study intralinguistic change), non-translated general Polish, and EU legislation in English (consulted whenever necessary as a parallel corpus). The corpora were analysed with Wordsmith Tools 6.0. The next two chapters are devoted to the analysis of the textual fit of the EU legislation translated into Polish at the macrostructural and microstructural level of textual organization. Chapter 5 begins with a global comparison of the corpora built and used during the project and thought-provoking observations on the changes that occurred in time in nontranslated Polish law. The author presents the findings about overrepresented, underrepresented, atypical and similar generic and grammatical patterns in translated texts in comparison to nontranslated texts within a few clearly stated functional areas. In chapter 6 the author continues to evaluate the degree of textual fit of the Polish eurolect at the microstructural level. The focus of attention is the behaviour of three types of collocations: lexical, term-forming and term-embedding. The observations presented in the chapter provide evidence for the untypical collocation hypothesis and against the normalisation and levelling out hypotheses (2014: 284), and seem to confirm that "any regularities (universals) related to textual fit are closely genre-related" (2014: 284). Moreover, the discovered atypicality "differ(s) depending on the type of collocations" (ibid.). Undoubtedly, "the translated law has developed its own patterns at the phrase level, some of which are salient enough to be regarded as generic features" (2014: 285). This leads to perceivable divergence at the level of textual fit and strengthens the validity of the notion of ´translationese´. The last chapter of the book provides an in-depth discussion and convincing interpretation of the collected data. The author clearly presents the limitations of her study, implications for further research and its applications, and — most importantly — fully operationalises textual fit by suggesting a detailed description model of this relation. Due to its nature, two types of textual fit are distinguished (i. e., convergent and divergent) and two scales on which it may be examined (i. e., global and local). Precise textual fit measures and variables are listed, which enables the accurate replication of the study with alternative research material. Subsequently, the author presents remarkable findings concerning the correlation between textual fit, equivalence and translation quality, as well as its genre-dependent character. The design of the study also allows for the formulation of a number of insightful and well-grounded observations concerning the features of non-translated legislative Polish, analysed against general Polish. Moreover, the author takes a closer look at the suggested Europeanisation of the Polish language. As far as the theoretical aspects of the study are concerned, the author summarizes her findings on the features of translation (or translation universals) and distances herself from the strong versions of the hypotheses. Since during the analysis some of the hypotheses have been confirmed (i.e., unique items, untypical collocations) and others have not (i.e., normalisation, standardisation and levelling out), it is suggested that claims concerning the independence of the features from norms, genres and language pairs are difficult to substantiate. Overall, in my opinion, Biel´s book is a crucial contribution to the development of Legal Translation Studies. As already mentioned, it contributes to research into a new linguistic phenomenon, i. e., eurolects, from the original perspective of a Slavonic language. The analysis is multidimensional, preceded by a comprehensive review of most up-to-date literature and research on topical issues such as EU translation, multilingualism, translation universals, genre and phraseology. Regarding the first theme, the opposing views on the nature of EU language are verified by the author on a large set of data, making the study even more justified. Biel not only operationalises the inspiring and important concept of textual fit, but also introduces an original continuum of phraseological units and discerns a hybrid variety of legal Polish, providing at the same time a precise description of internal variation of the Polish eurolect. Her strong focus on LSP [languages for special purposes] phraseology relates the study to other scarce but important investigations into legal phraseology (see, for example, Kjær (1990, 2007), Chromá (2004) and Goźdź-Roszkowski (2011)). Methodologically, Biel verifies the applicability of corpus-based methods to research into legal language and legal translation. 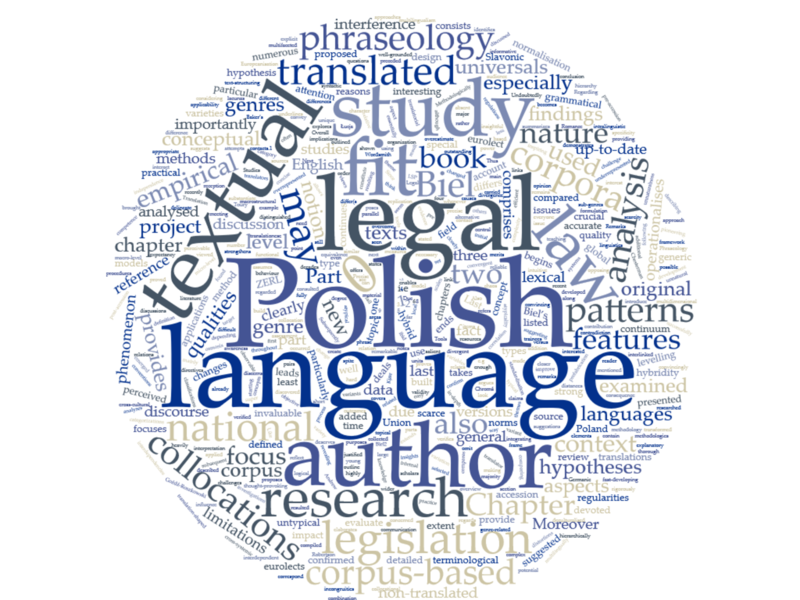 With this study, the author extends scarce corpus-based research into legal Polish. In spite of all the limitations listed, corpus-based methodology proves to be objective and reliable, as can be seen by the resulting contradiction of one of the initial intuitive hypotheses (cf. 2014: 199). It is hard to overestimate the merits of Biel´s outstanding book. It deserves the special attention of everyone who is interested not only in translation, but also in legal linguistics, EU legal communication, and language contact. In addition to the crucial theoretical insights outlined above, the study provides important empirical data on the prefabrication of language. It is easy to think about numerous practical applications of the study. Most importantly, the outcomes may be used to create invaluable resources for translators and translator trainees and to improve translation quality assessment models by integrating textual fit into the models. Also, the corpus built for the study may be used for further research and teaching. Last but not least, the author clearly states her awareness of the limitations of the study and offers practical suggestions about how they could be overcome in further research. Lost in the Eurofog: The Textual Fit of Translated Law. Frankfurt am Main [et al. ], Peter Lang 2014. ISBN: 978-3-63-164626-7. CHESTERMAN, Andrew (2004). “Hypotheses about translation universals” in: HANSEN, Gyde / MALMKJÆR, Kirsten / GILE, Daniel (eds.). Claims, Changes and Challenges in Translation Studies. Amsterdam / Philadelphia, John Benjamins Publishing Company, 1-13. CHROMÁ, Marta (2004). Legal Translation and the Dictionary. Tübingen, Max Niemeyer. GOŹDŹ-ROSZKOWSKI, Stanisław (2011). Patterns of Linguistic Variation in American Legal English. A Corpus-Based Study. Frankfurt am Main [et al], Peter Lang. KJÆR, Anne Lise (1990). “Context-conditioned word combinations in legal language.” Journal of the International Institute for Terminology Research 1 (1-2), 21-32. KJÆR, Anne Lise (2007). “Phrasemes in legal texts” in: BURGER, Harald / DOBROVOL´SKIJ, Dmitrij / KÜHN, Peter / NORRICK, Neal R. (eds.). Phraseologie: Ein internationales Handbuch der zeitgenössischen Forschung / Phraseology: An International Handbook of Contemporary Research. Vol. 1. Berlin [et al. ], de Gruyter, 506-516. TOURY, Gideon (2004). “Probabilistic explanation in translation studies. Welcome as they are, would they qualify as universals?” in: MAURANEN, Anna / KUJAMÄKI, Pekka (eds.) Translation Universals. Do they exist? Amsterdam / Philadelphia, John Benjamins Publishing Company, 15-32. TOURY, Gideon (1995). Descriptive Translation Studies and Beyond. Amsterdam / Philadelphia, John Benjamins Publishing Company. 1 I would like to sincerely thank Dr. Ross Aldridge, University of Gdańsk, for his generous help in proofreading this review. 2 Professor Łucja Biel is a leading Legal Translation scholar currently based at the University of Warsaw, a Corpus Linguistics researcher, an accomplished lecturer with international experience and a sworn translator. Dr. Justyna Giczela-Pastwa is a translation researcher and translator trainer, currently working as an Assistant Professor at the University of Gdańsk. She was a Visiting Lecturer at City University London (MA in Legal Translation) from 2012 to 2014. She holds a PhD in Linguistics, Postgraduate Diploma in Legal and Business Translation (University of Gdańsk), and an MA in Music (Academy of Music in Gdańsk). Her academic interests include legal translation, corpus-based translation studies and translator training. She has recently co-edited a volume of CETRA 2014 papers, (Norm-Focused and Culture-Related Inquiries in Translation Research, Peter Lang, 2016). Giczela-Pastwa, Justyna (2018). „Review of „Lost in the Eurofog: The Textual Fit of Translated Law“ von Lucja Biel“. Zeitschrift für Europäische Rechtslinguistik (ZERL). Köln: Europäische Rechtslinguistik, http://zerl.uni-koeln.de/giczela-pastwa-2018-review-eurofog-translated-law.html, (Datum des letzten Zugriffs). URN des PDFs: urn:nbn:de:hbz:38-75765.